AN inspirational fourth-quarter surge from Salisbury has resulted in a come-from-behind grand final win in the South Australian Women’s Football League (SAWFL). Salisbury’s Nicole Baker was named best-on-ground for her side after kicking a blinder of a goal in the last quarter to complement her high work ethic throughout the day. 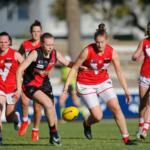 South Australia Under 18 forward, Katelyn Rosenzweig was one of the heroes inside 50 with two fourth-quarter majors to give her side an 18 point victory on the big stage. Congestion was the flavour of the game in the first couple of minutes with both teams displaying aggressive tackling and not giving an inch away. Adelaide University was the first side to hit the scoreboard when Taylor McKay opened up the game with some good tapwork, which created Adelaide University’s first inside 50. She was able to punch the ball to the ground and roved her own footy, which allowed Adele Gibson to deliver a high kick to the square. Jo Hill was then able to read the ball well in the goal square when she crumbed the footy and kicked the first goal of the day. Madisyn Freeman got involved for Salisbury when she got a clearance out of a stoppage in the centre of the ground and delivered a nice kick inside 50 to Jayme-Lee Sonneman on the lead. Freeman had a brilliant first quarter, taking a strong mark and creating good run and carry with the footy. The Blacks’ solid defence made it difficult for their opponents to score a goal, with plenty of numbers on the goal line. Salisbury was then gifted with a chance to register its first major when Brittany Perry received a 25 metre penalty for a simple scoring shot. Unfortunately, she missed, giving the Magpies their third behind. Katelyn Rosenzweig looked likely to give her side its first major when she took a great contested pack mark, but on a difficult angle, her kick went across the face. This was a blessing in disguise, as Demi Sonneman picked up the ball from a boundary throw-in and banged it through while being brought down, giving Salisbury its first major of the day. At the other end of the ground, Andie Zbierski performed a great run-down tackle on Stephanie Walker when she was streaming inside 50, continuing to give Salisbury the momentum early in the game. However, Walker was stretchered off after that tackle, leaving Adelaide University a player down before the end of the first quarter. In the last minute of the game, Jo Hill took a great one-on-one contested mark inside 50 to give the Blacks a five-point lead at quarter time. She also registered her second major of the quarter, scoring all of her side’s goals in the first term. The scoring dried up in the second quarter, with each team only managing one behind. The Blacks struggled to get the ball out of their back half but at the same time, Salisbury couldn’t punish them, despite some continual hard work by Madisyn Freeman at the stoppages. She was a ball magnet across the ground, taking a good intercept mark and doing everything she could to clear the ball out of congestion. Jo Hill also continued to display her marking prowess when she took a great juggling mark on centre-wing to give Adelaide University the chance to go forward. Another highlight came when Adelaide University’s Cassandra Tsoumbris sold some candy on the boundary line, but it wasn’t enough as the ball was locked in Salisbury’s forward half for most of the term. Despite this, the Magpies went into the second half with a five-point deficit. The high-pressure football continued in the third term with strong tackling and stoppage football dominating play. Adelaide University got the breakthrough in the 11th minute of the quarter when Kelly Baltrop took it out of the ruck and gave off a quick handball to Elisabeth Davison, who was able to bend it around the corner and break the scoring drought. The major gave the Blacks a nine-point lead after they scored their first goal since the first quarter. Shortly after, Paige Allan provided a highlight for the struggling Magpies when she performed a great run-down tackle to win back possession and give her side an opportunity to respond to Adelaide University’s pressure. But it didn’t take long for the Blacks to get the ball back, with South Australia Under 18 captain, Esther Boles firing a shot at goal which just drifted to the right, extending the Blacks’ lead to 12 points. A late behind from Magpie, Shannon Murphy reduced Adelaide University’s lead to 11 points at three quarter time, with the game well and truly not over. The Magpies started the fourth quarter with intent, with Brittany Perry booting the ball inside 50, giving Kasia Culhane a huge chance to give her side the upper hand in the last term. On the run, she panicked and missed the goal, giving Adelaide University the opportunity to rebound and keep the momentum. Not long after, one of the Magpies’ prominent players, Nicole Baker delivered a long kick towards their forward half, allowing Sophie Hoyle to turn away from her opponent and burst inside 50. Before she blazed away, she spotted up Katelyn Rosenzweig, who took another great contested mark to give her a second shot on goal. This time, her angle was much easier, as she received a 25 metre penalty and made no mistake from straight in front, reducing her side’s deficit to four points. Salisbury then took the lead for the first time in the game, courtesy of another combined effort from Rosenzweig and Hoyle. This time the roles were reversed, as Rosenzweig picked the ball up cleanly off the ground and gave off a rapid handball to Hoyle in the goal square, who kicked truly to give Salisbury the momentum. It didn’t take long for Salisbury to extend its lead, as Monique Hollick’s kick towards goal was kept in by her teammates on the goal line, despite the ball flying across the face. 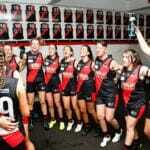 This gave Nicole Baker the chance to display her footy smarts when she kicked an inside-out goal from the goal square to extend her side’s lead to nine points halfway through the last term. Rosenzweig then kicked her second major of the day on the back of another brilliant contested mark. She read the high kick inside 50 perfectly and marked just outside the goal square straight in front, allowing her to increase the Magpies’ lead to 16 points with six minutes remaining in the game. Adelaide University had no answers to Salisbury’s reinvigorated pressure, with the ball being locked in the Magpies’ forward half for the quarter. After two late behinds from Salisbury, the margin was extended to 18 points, and with Adelaide University unable to score in the last quarter, it gave the Magpies a monumental victory at Aldi Arena. 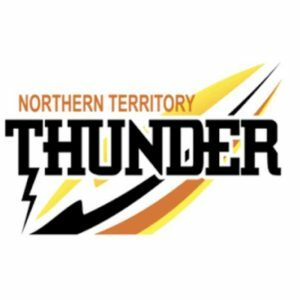 MINOR premiers, Morphettville Park has been knocked off in the preliminary final by Salisbury in the South Australian Women’s Football League (SAWFL) Division One. However, its reserves made it to the big stage after a comfortable win over Christies Beach, making for a compelling day of Grand Finals at Aldi Arena on Sunday. Morphettville Park: L. Bellinger, C. Swanson, E. Fauser. Salisbury: N. Baker 2, J. Sonneman 2, S. Hoyle. Salisbury has knocked off minor premiers, Morphettville Park in a thriller to make its way into the SAWFL Grand Final. The Magpies were able to capitalise on a slow start from the Roos, where they only kicked three behinds in the first quarter. They then fought back in the second quarter, kicking three goals to one to take the lead going into the main break. But that was all the Roos could manage in terms of goal kicking, failing to register a major in the second half. Salisbury took advantage of this by kicking three second-half goals to seal a spot on the big stage next week. Nicole Baker was the only multiple goal kicker on the day, booting two out of Salisbury’s five goals. She was complemented by majors from Jayme-Lee Sonneman and Sophie Hoyle. Sonneman was also named best-on-ground for the Magpies while South Australia Under 18 representatives, Madisyn Freeman and Katelyn Rosenzweig were named second and fourth-best respectively. For Morphettville Park, Lucy Bellinger, Caitlyn Swanson and Ellen Fauser were the goal kickers and Fauser was also named best-on-ground. 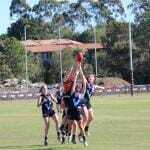 Lauren Buchanan, Brianna Walling, Maya Rigter, Hannah Priest and Lisa Whiteley were also shining lights for the Roos. Morphettville Park: K. Pedlar 4, K. Buchalka 2, A. Magi, C. Karamoshos, E. Williams. Christies Beach: E. Brockhurst, C. Coombe. Christies Beach got off to a slow start in this match, failing to register a major in the first half. Morphettville Park took advantage of this, kicking away to a 39-point lead at half-time. The Saints were able to even out the scoring in the second half, kicking two goals compared to Morphettville Park’s three majors. But the Roos’ superior scoring power proved too difficult to overcome for the Saints, and they ultimately fell short of the Roos, and of a Grand Final, by 43 points. Kale Pedlar was best-on-ground for the Roos with four goals while Kaily Buchalka kicked two. 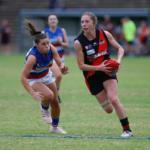 Amelia Magi, Chloe Karamoshos and Emily Williams were the other single goal kickers for Morphettville Park. For Christies Beach, Emily Brockhurst and Casie Coombe were the goal kickers while Tammy Campbell was named best-on-ground. 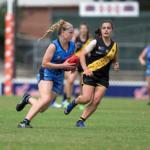 Both goal kickers were also named among the Saints’ best, along with Layla Fitzgibbons and Melinda Kelly. Morphettville Park will now face off against minor premiers, Adelaide University in next week’s Grand Final.